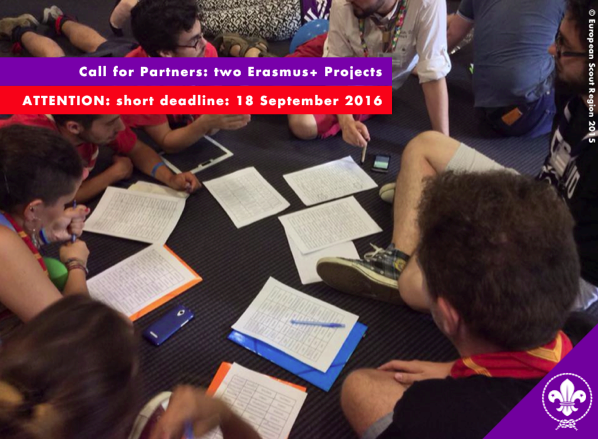 The European Scout Region of WOSM is launching a Call for Project Partners for regional events planned in 2017 and 2018. 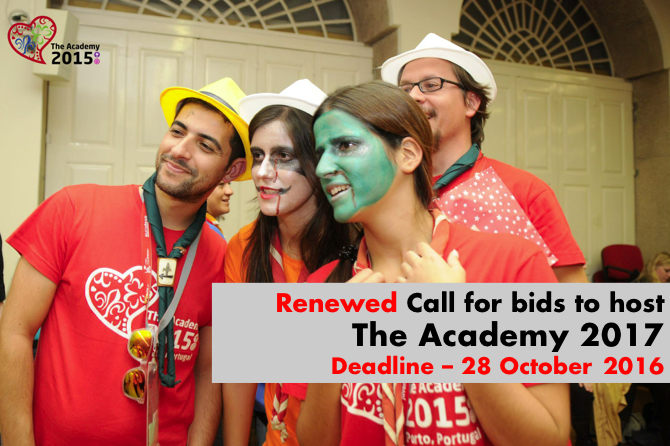 The European Scout Region of WOSM and the Europe Region WAGGGS are launching this Renewed Call for Bids to host The Academy 2017 due to the withdrawal of the sole bid received following the original call. The Academy is a joint event of WOSM and WAGGGS working in partnership at European level, with key participation of volunteers and staff from both the Europe Region WAGGGS and the European Scout Region. Interested associations, NSOs or MOs, are invited to declare their interest to hosting this event by submitting a short paper (the bid) in reponse to the attached Joint Ciruclar. The Network Meeting is an annual event organised by the Europe Region of WAGGGS and the WOSM-European Region gathering Guides and Scouts representing their MO/NSO in various platforms including their National Youth Council. This year the meeting will take place in the Youth Centre of the Council of Europe in Budapest from Monday 7 November 2016 in the morning until Thursday 10 November 2016 in the evening. Participants are expected to arrive on Sunday 6 November and leave on Friday 11 November. The aim of the meeting is to improve our members impact on society by supporting them in the field of External Relations. Participants representing their organisation externally, in their National Youth Council or towards any other external platform or institution are warmly invited to attend. The participation fee for the event is 50 euros per person covering four nights, accommodation and subsistence for the 4 days of the training. All transportation will be reimbursed directly to the participants by the Council of Europe upon arrival. The European Scout Region and Scoutisme Français are happy to invite you to the Fundraisers’ Network meeting that will be held between 25-27 November in Paris. This meeting offers NSOs and NSAs an opportunity to share best practices, challenges and needs in the field of fundraising, with a focus on Private Donors. Volunteers and/or staff members working with fundraising at national level in their organisations and board members working on financial strategy are warmly invited to participate. The participation fee for this event is 230 euros and does not include travel to the venue but covers the accommodation on the 25-26 November. We are looking forward to welcoming you to Paris for the Fundraisers Network Meeting 2016! As the Overture Diversity Network’s Steering Group, we have the pleasure to invite you to the next Overture Diversity Network Meeting in Dublin, Ireland. This meeting will be hosted by Catholic Guides of Ireland (CGI), from 14 to 16 October 2016. The steering group and hosting team have planned a great weekend around our subject of ethnic and social diversity and disability. The meeting will be an opportunity to meet open- and likeminded Guides and Scouts working in this area across the European Regions of WOSM and WAGGGS. We very much hope to see all of you, new and old, networking to make the two European Regions and their member organisations more open and inclusive. All relevant information about the event is contained in the Invitation and Practical Information. A registration form for the Overture Diversity Network Meeting is avaialble on the website of the Catholic Guides of Ireland. The Overture Diversity Network’s Steering Group is pleased to announce that some funding was received from WAGGGS to assist in the running costs of the meeting. The participation fee is therefore lowered from EUR 95.00 to EUR 80.00.